This cereal is exactly what you would expect... classic Kellogg's Corn Flakes dusted with cinnamon. There's nothing new or extraordinary in terms of flavor, but this extension of the Kellogg's Corn Flakes line works. It feels like it should have happened 40 years ago. It feels right. It tastes good. I liked it. In fact, I was so enamored I wrote it an affectionate letter. Where have you been all my life, beautiful? You're different from a lot of the new cereals I meet. You're somehow timeless - as if you were always meant to be. I really had a nice time with you this morning. I like your name. It's so fitting. Simply Cinnamon. You know you've got flavor, baby. But you keep it cool. You don't have to flaunt it like the others. I want more of you. You're kind of sweet. What are you doing tomorrow? You smell nice. I like your box. It looks good on you. It's simple and classic... like you. I hope you stick around a while. I want you to meet my friends. I've been burned by other cereals (Caramel Nut Crunch in 2006). I fall for them and then they just disappear. You would never do that to me, would you? 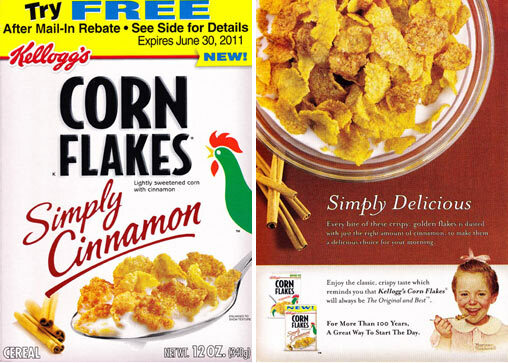 The Kellogg's Corn Flake before you, Touch of Honey Corn Flakes, disappeared. But I expected that. It was a cheap Corn Flake - a copycat, flash-in-the-pan that tasted too much like the original. Not like you. You're special. Stick around for me. Anyway... I guess this is just my long-winded way of saying I think you're neat. Take care of yourself. Nutritional concerns: Each 1 cup serving has 120 calories, 0 total fat, less than 1 gram of dietary fiber, 0mg cholesterol, 210mg sodium, 6 grams sugars and 2 grams protein. Haters of high fructose corn syrup beware... it's the third ingredient listed on the side panel. 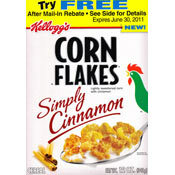 What do you think of Simply Cinnamon Corn Flakes? 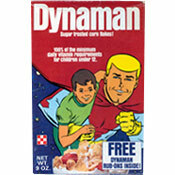 I LOVED this cereal! After my 3rd bowl for dinner one evening my husband asked if I shouldn't just pour milk in the box. They are delicious and sadly I can't find them anywhere. Way to go Kellogg's every bite is like a bite out of a cinnamon roll. Yummy!!!!!!! Right now, there seems to be a rush to cereals with cinnamon in them. This just seems to follow the pack and I found it edible but rather bland. I am not a Corn Flakes fan but would choose it over this entry. Not as good as cinnamon cheerios. Too light on the cinnamon -- they just taste like sweet corn flakes. Great recipe cereal. Makes a wonderful base for baked apple pastry squares. Not bad too eat, sweet and a nice 1/2 cup desert. Where is the cinnamon? I can't even taste it.